Something that folks of the Depression era seemed to have a much better grasp on than the Generation X and Yers is the concept of needs versus wants. Clearly defining these and coming up with an approach to pay for them is likely to change your outlook on spending. 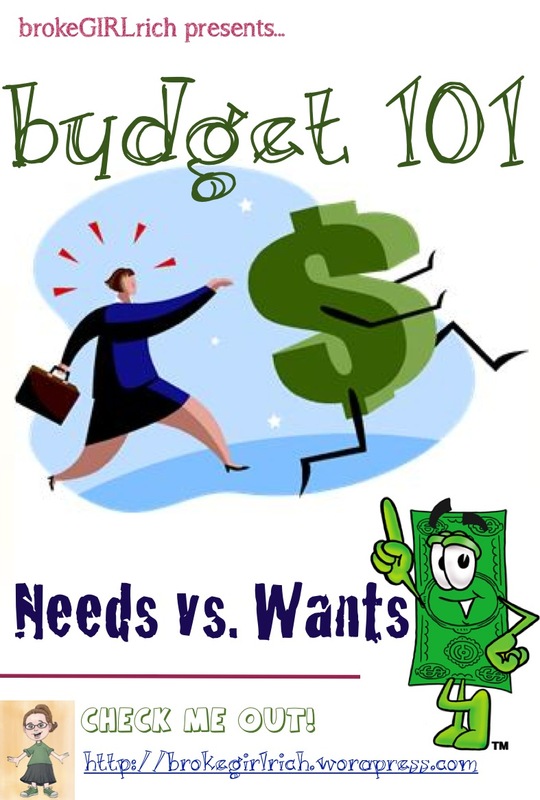 However, even defining these as the things you need, there are clearly different levels of want versus need in each one. Someone staying, for free, at a homeless shelter, has shelter covered, the same way someone dumpster diving is still managing to eat. On the opposite side of the spectrum, someone with a four story, 30-room mansion has achieved shelter, and may opt to eat lobster, caviar and champagne for dinner each night. Am I recommending these paths? No (I mean, we’ll talk about goals soon, and maybe the mansion and lobster fit in that discussion, but probably not in this one for most brokeGIRLrich readers). You do need shelter, but you need to consider your budget when figuring out where you’re going to live. Is it definitely time to move out of your parents’ house (especially if you have a good relationship with them and it’s just an annoyance to you being there)? Do you really need three bedrooms in your rental apartment or could you deal with sharing a bedroom or making your kids share? Do you need a four bedroom house or would two do? Can you buy the much cheaper fixer-upper and make plans over the next few years to improve it as your budget allows instead of splurging for the house with the living room already painted the color you like? You do need food, but does it have to come from Whole Foods, Fresh & Easy and Trader Joe’s? Walmart, Safeway and A&P will provide you with healthy food for half the price of those places, especially if you’re on a strained budget. And spending 10 minutes clipping coupons could save you even more cash. 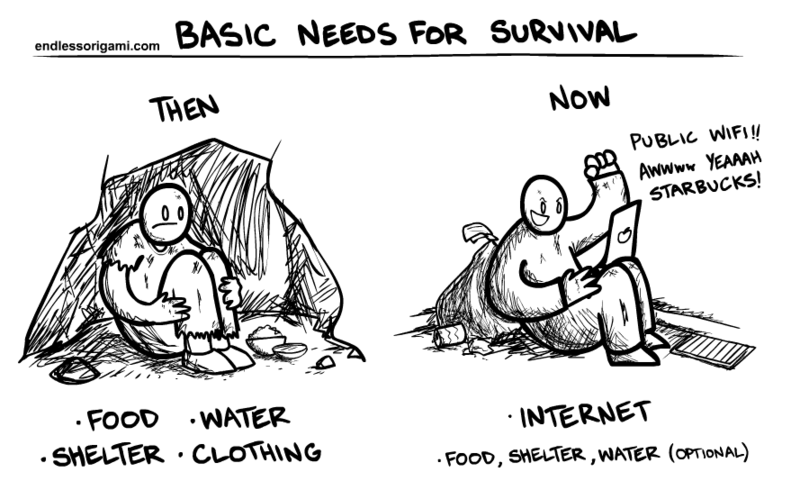 On top of that, even your shopping list (because you should be making one) can be whittled down to needs versus wants. You probably need some chicken and vegetables, you probably don’t need 2 boxes of Oreos, a container of ice cream, a chocolate bar and a six pack of hard apple cider (literally my last shopping trip right there). And let’s not even get started on clothing. I love clothes shopping, but honestly, I imagine it’s a rare day when any of us need to do it. I have clothing coming out of my eyeballs. And there are times when I say I need to go buy something, but 95% of the time, it’s really just that I don’t like or want to wear any of the things I have in that category. Seriously, I’m such a weirdo that even this past week, I thought, I need a new dress for my friend’s rehearsal dinner (despite having at least 3 in my closet) – which is totally a want – and then duct taped my work shoes together when the soles on both of them split in half during the week – totally a need, I just don’t want to spend my money on crummy work shoes. I will probably keep duct taping them until I qualify for a uniform stipend again at work since I bought pants with the last one. I’m definitely not advocating that you need to be as ghetto as I am at times, but just that you can clearly separate what is a want and what is a need in your mind. You need to find a way to pay for a need. I agree. Sometimes when you’re totally strapped though, you need to make sure your need really is a need. If you’ve been laid off and your mortgage is killing you, it might be time to sell. Of course, if no one’s buying and you’re just stuck in it, figuring out a way to pay that mortgage is still very much a need. So is eating and clothing yourself and your family, as well as buying medicine and any sort of doctor or hospital visits to stay alive. If you want an iPhone, make sure you can actually afford it. Those things are ridiculously expensive, but I wanted one from the moment they came out (and my whole family can tell you I’m totally not a keeping up with the Joneses sort). For some reason, I thought everything about them was so cool (still do – although smart phones now come in a wider variety). In my case, the actual phone wound up being a gift and, on my family’s plan, it was only an additional $30 a month to add me. No problem. However, if I ever go out on my own, the average plan is $100-$120 a month. That’s insane. Especially with how much free wi-fi there is around these days. I would save a ridiculous amount of money by switch back to an iPod to connect to wi-fi and getting a prepaid phone. And that is probably what I will do someday. Also, even the purchase of the phone is something to think about. A new iPhone 5S over at Verizon will run you $99-$199 (depending on how much memory it has) and that’s if you lock in with a 2 year plan. It’s $649.99 without a plan. A new iPhone 4 is $.99 (that’s right, less than a dollar) with a 2 year contract (It’s like $450 without a contract, which is ridiculous. You can find it way cheaper elsewhere, I bet). If you have a shoe fetish, make sure you can afford it. If it’s something that makes you really happy, just plan for it in your budget. Set aside $50 a week as shoe money and buy crazy shoes every other month or so. But only set aside that money after all your bills are paid, you’ve contributed to your emergency savings fund and maxed out your retirement contributions. You can figure out a plan for anything you need. After you’ve figured out those plans, you can budget for what you want. A great exercise for this is to go to your last credit card statement for the card you use for most purchases and break down the purchases into needs and wants. Maybe you’re right on track. Maybe you’ll find you need a little more work at becoming a better budgeter. Either way, you’ll be more in the know about your finances. If you’d like a worksheet to help get you started with that plan, you can go here and download mine. And make sure to enter this month’s drawing – a free copy of The Budget Kit by Judy Lawrence. Contest ends October 31st. Great post, Melissa! The lack of understanding in this country about needs vs. wants is a HUGE problem, IMHO, and what has gotten SO many of us (myself included) into financial trouble. Today’s America is seriously addicted to “instant gratification”. Thanks, Laurie! I totally agree (clearly) about the instant gratification problem, but I get that it’s such a hard habit to break too. Honestly, the more I get into investing though and start looking at things like a bottle of nail polish as two shares of a stock I’m researching or those cool shoes as a stock of Exxon or Dollar Tree, it’s actually a little easier to say no (although darn that Sally Hansen and her crackle nail polishes and those new fuzzy one and the ones with the magnets on them…. *sigh* I just want to play with them all- at least once in a blue moon there are coupons for them).